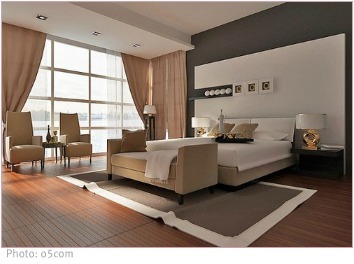 I’ve decided to lay out some interior design ideas to allow you to bring about a certain mood or feeling in your home. Creating a mood for your home is a very personal thing. While some will say that there are definite rules you must follow to compose the feel you want, I tend to disagree. What may be beautiful and cosy to me may feel overbearing and bright to someone else. That is why effecting a mood for your home is about knowing yourself. 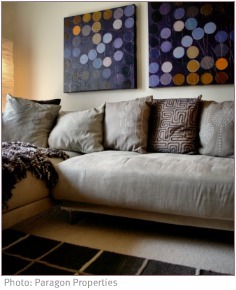 You need to be in touch with what “does it” for you, in terms of the furniture and décor and most importantly colour. You may find that when looking at pictures of rooms that you like there is an emotion or mood that is evoked is due to the picture composition, furniture style and colours used. You need to tap into this to imagine that very same mood in your surroundings. Whether you are looking for a romantic haven or a glamorous get up, your room’s atmosphere is in your power to put together. Often the key to a room with atmosphere is the colours you choose. Large areas of a particular hue influence the feelings and moods of people. When I start on a project to create a certain ambience the very first thing I do is to picture what tone would encapsulate the feeling I’m after. If you find imagining colours to be a little tricky then it helps to use visual aids like paint swatches or coloured cardboard. Don’t just seek out tints that you like, the principal thing is to look at the colour and become aware of how it makes you feel, you may end up choosing very different hues to what you would have if you were just going on preference. The next thing I would do is analyse my furniture. Do the furniture pieces I have contribute towards the mood I’ve chosen? Do I need to update them with some paint or do I need to re-upholster in different fabric? Do I need to add more items or take out some? Your furniture forms the basic shell for your ambience, and it also contributes to your overall feel. When I think of a relaxing interior, do you know the one thing that says comfortable to me? Its slip-covered sofas, there’s something so casual and inviting about those sofas, the deep cushions, and unpretentious style. It says don’t worry, just relax. So choose every piece wisely for what they “say” to you, so that your scheme is consistent and harmonious. Now for those accessories: select your accessories if they complement the feel of the room and add to the mood that you are creating. Its lots of fun to find those special details that bring out the atmosphere you want. I’ve thought about the accessories that I would use in my interior design, ideas for a peaceful room and a trendy room are shown to illustrate how I’d put it all together. You will need to think about the fabrics you’ll need, the lighting, window treatments, flooring options (area rugs), artworks, the soft furnishings and of course the ornamental pieces as well. Sometimes it will be easier to choose a mood for your home instead of a design style. While a design style has some rules, or features, necessary to create a certain look a mood is entirely personal. You can combine mood with style to take things in a specific direction. Above all, let your talents and uniqueness shine through and enjoy making those interior design ideas and dreams come true.